Don’t miss out on this unprecedented offer. Outsource your payroll to Paychex — available for a limited time! "When I first started, my wife used to do my payroll for me, but it didn't always work out because I'm too busy, she's too busy ... so her brother, who's a CPA, suggested that I should use Paychex. Having Paychex as my payroll service just makes my life a lot easier." "Every time I turn around, there's something else that this system can do that I can learn about and just makes my life easier, makes it more convenient for my staff." "Paychex has a very comprehensive offering of services. They offer just about anything anybody could want. It's good to have all those options, and integrating with the payroll is a big help as well. It just makes life easier — it saves us a lot of time." 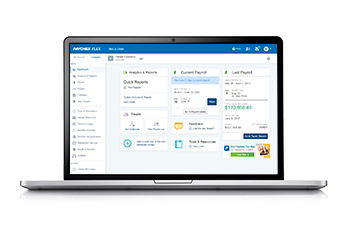 Easily expand Paychex Flex beyond payroll by turning on HR modules, from recruiting and hiring to time and attendance and benefits, as your business needs change. Our world-class compliance team lives and breathes payroll for small business. We use that expertise to update our systems so our clients are ahead of the regulatory curve. You’ll have the option to work with a dedicated payroll specialist, plus 24/7 support from highly trained, U.S. based specialists. Every Paychex client gets access to our online HR library, a comprehensive resource full of forms, training, and tools.